As a child, I spent many a 4th of July in Southampton, NY visiting friends of our family. Talk about the quintessential 4th celebration! The holiday always started with the 4th of July parade down main street. To prepare for the parade we dressed in red, white, and blue and decorated our bikes with streamers and paper. After the parade everyone in the neighborhood came together for a big day-long cook out. The night was capped off by fireworks on the beach and ice cold water melon. Today I am off to Williamsburg, Virginia for the holiday. Tomorrow we'll celebrate by decorating and riding a golf cart in a neighborhood parade, attending a family BBQ, and watching fire works explode over the James River. In addition to spending time with family and friends, I am most looking forward to decorating the golf cart (I promise to post pictures). 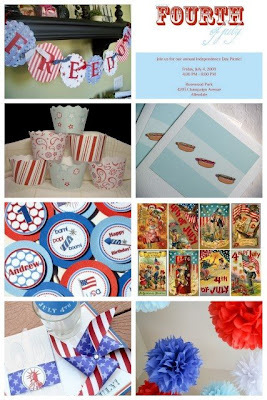 While surfing Etsy for inspiration I came across many wonderful July 4th inspired paper products, several of which are downloadable templates. Enjoy!